With the month of December coming up, the Manufacture Prunier, in Montpont-Ménestrol in the Dordogne, is fully busy. About 120 kilos of caviar that will be marketed in the coming weeks. With a precise gesture, the pockets of the precious eggs are removed before being delicately placed in a “cassin” where they will be weighed and will receive a lot number. Laurent Sabeau, the manager of breeding, then sorts the pockets according to their color – “the clearer they are, the better they are” – and the quality of the eggs. 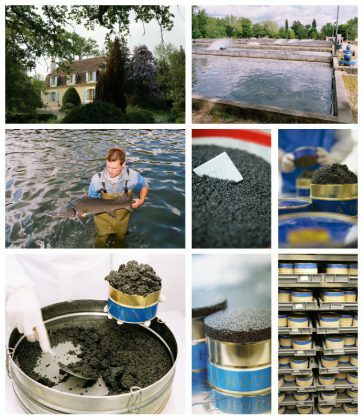 Then begins the preparation of caviar properly so called. With a precise and delicate gesture, the eggs are extracted from the pockets before being again weighed to determine the exact amount of salt needed. “To make a good caviar, salt is essential. It must be very pure and of a very fine granulometry, “explains Valerie Sabeau who has the task of mixing eggs and salt. Her hand draws a ballet: it caresses the eggs, incorporates the salt with gestures supple and controlled. In a few moments, on contact with salt, the eggs seem to swell, to associate with each other. On the large table, boxes of 75 g to one kilo stack, waiting to be delicately filled and then pressed. This is one of the specificities of the Prunier house: a packaging in “original boxes”, not set before maturation, from a few days to a few weeks. While waiting to reach the tables of the Parisian restaurant Prunier, but also those of other famous tables and to rejoice the savvy amateurs.